As far as Infrastructure management is concerned, Nagios is one of the most powerful and open source software that can be used for network and infrastructure monitoring. Nagios will monitor servers, switches, applications and services. 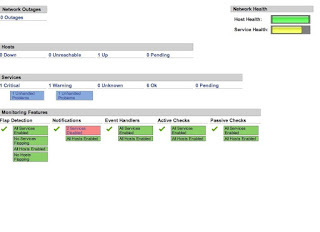 It alerts the System Administrator when something went wrong and also alerts back when the issues has been rectified. – Monitor your entire IT infrastructure. – Identify problems before they occur. – Know immediately when problems arise. – Plan and budget for IT upgrades. – Reduce downtime and business losses. Our Scenario is to install nagios on Linux Server. Please install all below required dependencies for Nagios through yum server, because installing these packages individually is more complicated. So we recommended to go with Yum server. I have downloaded from the below direct link and kept in my linux server already in the folder /home/learnitguide. Before going for installation, please create a dedicated user and group for nagios. Changing password for user nagios. Create a new nagcmd group for allowing external commands to be submitted through the web interface. Add both the nagios user and the apache user to the group. Now, first we will configure Nagios Core and to do so we need to go to Nagios directory and run configure file and if everything goes fine, it will show the output in the end as type 'make all' to compile the main program and CGIs. Now, after configuring we need to Compile and install all the binaries with make command and make install command will install all the needed libraries in your machine and we can proceed further. Following command will install the init scripts for Nagios. To make nagios work from command line we need to install command-mode. Next, install sample nagios files, please run following command. Open the “contacts.cfg” file with your choice of editor and set the email address associated with the nagiosadmin contact definition to receiving email alerts. We are done with all configuration in the backend, now we will configure Web Interface for Nagios with following command. The below command will Configure Web interface for Nagios and a web admin user will be created “nagiosadmin”. In this step, we will be creating a password for “nagiosadmin”. After executing this command, please provide a password twice and keep it remember because this password will be used when you login in the Nagios Web interface. Restart Apache to make the new settings take effect. We have downloaded nagios plugins in /home/learnitguide/nagios-plugins-2.0.3, Go there and configure and install it as directed below. Now we are all done with Nagios configuration and its time to verify it and to do so please insert following command. If everything goes smooth it will show up similar to below output. To make Nagios work across reboots, we need to add nagios and https with chkconfig command. Restart Nagios to make the new settings take effect. Note : Please turn off your iptables and selinux or add the nagios ports to allow. Your nagios is ready to work, please open it in your browser with “http://Your-server-IP-address/nagios” or “http://192.168.2.1/nagios” and provide the username “nagiosadmin” and password. Please check other posts for configuring or adding linux clients and windows clients to the nagios server. Leave a comments if you have any concerns. Thank You. LearnITGuide.net © 2019. All Rights Reserved.